Russian police have discovered one of the country's most grisly cases of cannibalism after pictures of dismembered bodies were found on a phone belonging to one of the main suspects. The crimes were uncovered when a cell phone, which included images of the man posing with a dismembered female victim, was found on a street in Krasnodar earlier this month. The remains of the woman were found in a bag nearby the following day. Dmitry Baksheev, 35, from Krasnodar in southern Russia was identified as having told interrogators he began his macabre reign of terror in 1999. He and his wife Natalia, 42, a nurse, were part of a 'cannibal family', which is known to have links to Russian law enforcement. Baksheev and his spouse stored human remains in their fridge and freezer as well as a cellar; along with seven packs of frozen body parts. The couple also apparently preserved some 'meat' in jars, with one image showing what is alleged to be human remains pickled in a jar. 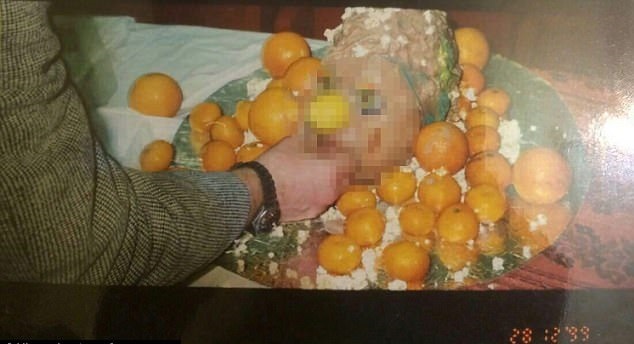 One picture shows a human head on a plate surrounded by oranges. 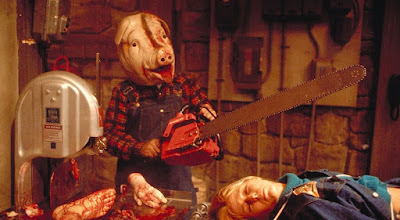 It is dated 28 December 1999 - which, if valid, leads to the suspicion that the confession of an 18-year reign of terror as a cannibal is correct. Dmitry and Natalia useda combination of ether and a Russian drug Corvalol (main substance is Phenobarbital) to make their victims sleep.